Puget Sound is BIG and so are the problems facing its protection and recovery. In order to better understand the scope of the issues facing recovery and the efforts that are being implemented, a comprehensive holistic view of the area is essential. FishViews, a Social Enterprise that creates environmental technology to build virtual maps of waterways, and a soon to be named non-profit partner, will work together to help make this common understanding possible. By using FishViews’ customized 360 virtual reality cameras and online mapping technology, every inch of the Puget Sound shore can be accessed from a desktop, mobile or virtual device. Why Contribute to Mapping Puget Sound? Puget Sound is a critical economic engine for North America. It is the second largest estuary in the United States. The boundaries of the basin include dozens of state parks, eight national parks, wildlife refuges, forests and other critical public lands. It is the largest oyster producer in North America and contributes to a wide variety of seafood products. Puget Sound is also home to some of the largest ports and military bases in the nation. Puget Sound’s beauty and economic activity make the waterway a focal point of the region, however the ecosystem decline is a serious concern that is often overlooked. Approximately 70 percent of the Puget Sound’s original estuaries and wetlands have disappeared due to urban and agricultural development, and dangerous contamination has closed swimming beaches and shellfish beds. Fish and marine life struggle to survive in oxygen-starved dead zones in the South Sound and Hood Canal. Keystone species like salmon and orcas are listed as endangered or threatened. Where the waters of Puget Sound meet the land is a primary source for the decline of Puget Sound health. Here shoreline modification and source and non-source point pollution take a toll on functioning habitat. Washington’s Shoreline Management Act requires plans from stakeholders to protect the habitat. Well managed shorelines are critical for orcas, salmon, eelgrass and forage fish, that need clean water. The funding campaign will launch June 1st. We are looking for early stage support now. These tax deductible contributions from sponsors and partners will help initialize the project by providing resources, and strategic and logistical support. See the progress of conservation. Learn about history and habitat, and engage and collaborate as advocates for Puget Sound. 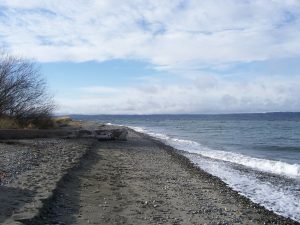 Example of FishView along Puget Sound Shore. FishViews vision is to connect people to waterways. FishViews partners with waterway managers and others to help achieve this mission. FishViews developed technology to bring waterways to your desktop, mobile or VR device via easy-to-use, publicly available, 360 interactive virtual tours. These reality based maps have many uses for waterway safety, recreation, science and conservation. See it before you get there to enhance waterway emergency management and navigation. Scope areas for recreation activities. Educate with virtual field trips. Visualize waterway data in context. Digitally preserve the waterway, creating a historical baseline of conditions.